The name sage is derived from the Latin word “salvus (safe) which is appropriate considering it was original used for medicinal, as well as culinary purposes. Fresh sage sprigs have long, narrow grayish-green leaves and, although it is a member of the mint family, has a musty, smoky aroma. There is also a variety called pineapple sage, which has strong pineapple smell to it. 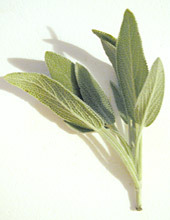 Sage is used in sausage, stuffing, pizza sauce and fish dishes. Fresh sage is available year round, or you can find whole, crumbled (rubbed) or ground. Fresh sage can be refrigerated for about a week, while dried should be kept in an airtight container and stored in a cool dry place. This entry was posted on Saturday, November 3rd, 2007 at 6:53 am	and is filed under Encylopedia, Herbs & Spices. You can follow any responses to this entry through the RSS 2.0 feed. You can leave a response, or trackback from your own site.